The prize at the end of Germany's 1942 summer offensive was Stalingrad. The city, while being a propaganda key due to its name, was also a key industrial city sitting upon both rail and river networks. The German 6th Army hit arrived at the west bank of the Volga by late August and began their assault on the city. "Stalingrad must not be taken by the enemy" ordered Stalin. Now you can command the defense of the city and try to hold versus a talented, but stretched thin, German Army. Or will you find something the Germans didn't and seize both the city and the day? As has become common with games in the IGS line, playability matched with historical flavor has been achieved to a remarkable degree. In Storm Over Stalingrad, players alternate impulses where they move or fire, but only rarely both. Cards influence play, but do not drive the game. Can you take most of the city of Stalingrad before the Soviet offensive begins? 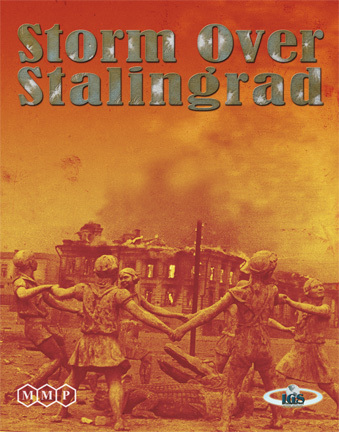 Storm Over Stalingrad was designed by Tetsuya Nakamura, English development by Adam Starkweather, and artwork by Nicolas Eskubi.